I love to cook, to experiment with what is growing in my garden and to collect wildfare. I want to share with you my ideas for preparing food with colour, texture and delicious flavours. A paving stone in an innovative playground was a springboard for me to think about spring salads and some of the edible weeds available early spring. Why not let weeds contribute to your salads? 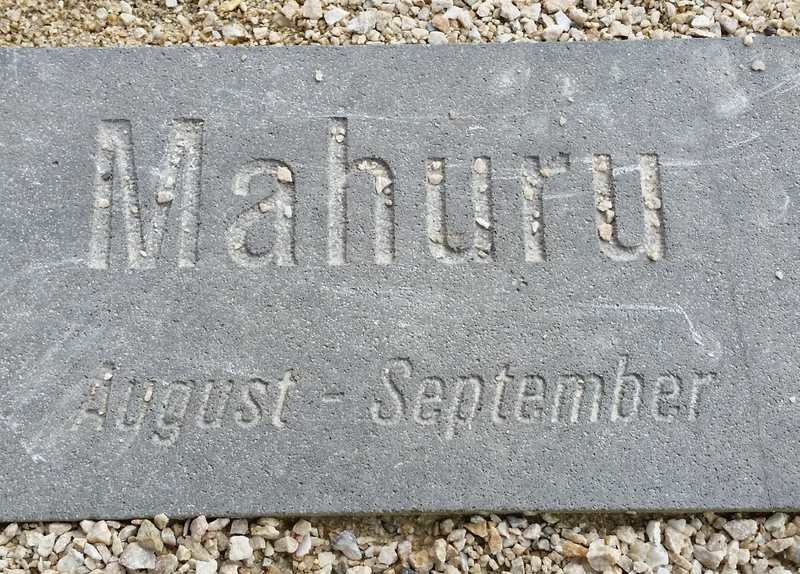 The Maori word “Mahuru” means August-September. This was one of many pavers around a slide complex in the developing Wynyard Quarter residential area of Auckland that reflects on weather, seasons and gardening. I like that there are areas of text on the woodwork and pavers for parents to contemplate on while watching their children play on the slides. Mahuru is the Goddess of Spring here in Aotearoa. Spring’s longer hours of daylight and warming of temperatures signals tough pioneer weeds to burst forth in abundance. Weeds are not only tough guy survivors, they usually contain more nutrients than your average well bred garden vegetable and some taste pretty good too. So until the lettuces come on through in numbers I suggest eating some of these uninvited guests. Endive, shaved fennel, pear and mandarin salad. 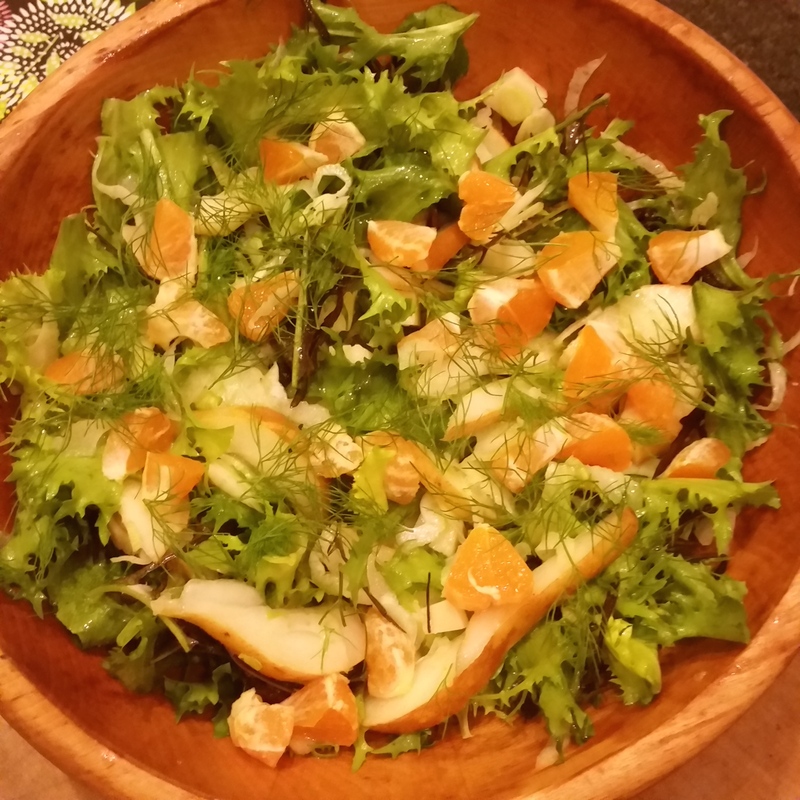 For leaves with an element of bitterness, like endive or dandelion, then it really helps to contrast with some sweetness – in this salad pears and mandarins. 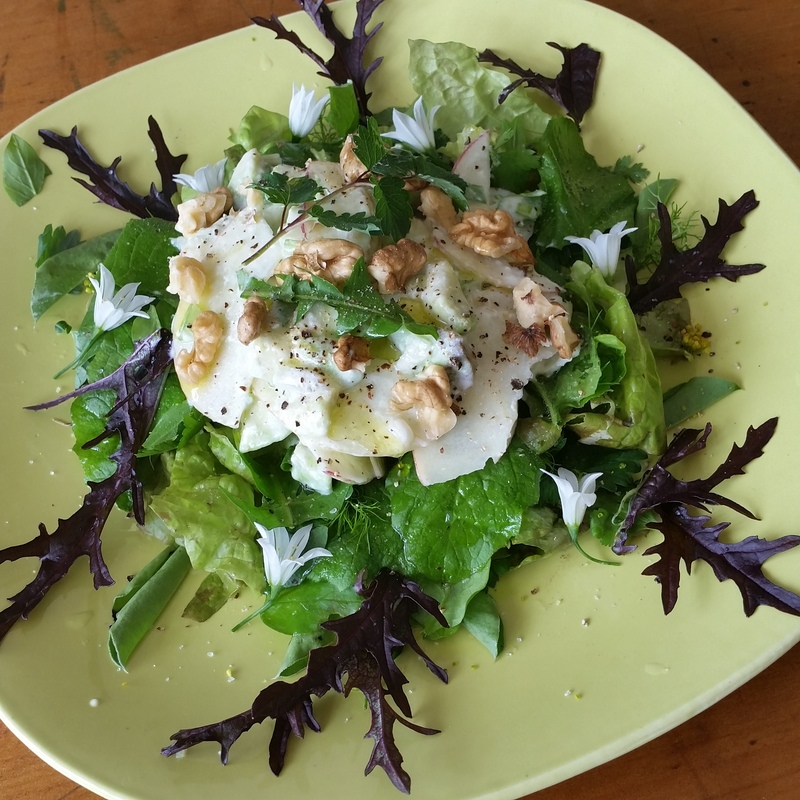 Broadband leaf shoots and flowers, fennel leaves and walnuts are also present. Be bold – try different combinations. For a quick lunchtime salad I like to utilise leftovers with additions from plants ideally gathered fresh from the garden minutes before. A lunchtime salad of couscous, endive, Italian rocket, mixed green weeds, parsley, salad burnet, onion weed and flowers, violet flowers, half an avocado and half a mandarin with a sprinkling of walnuts. 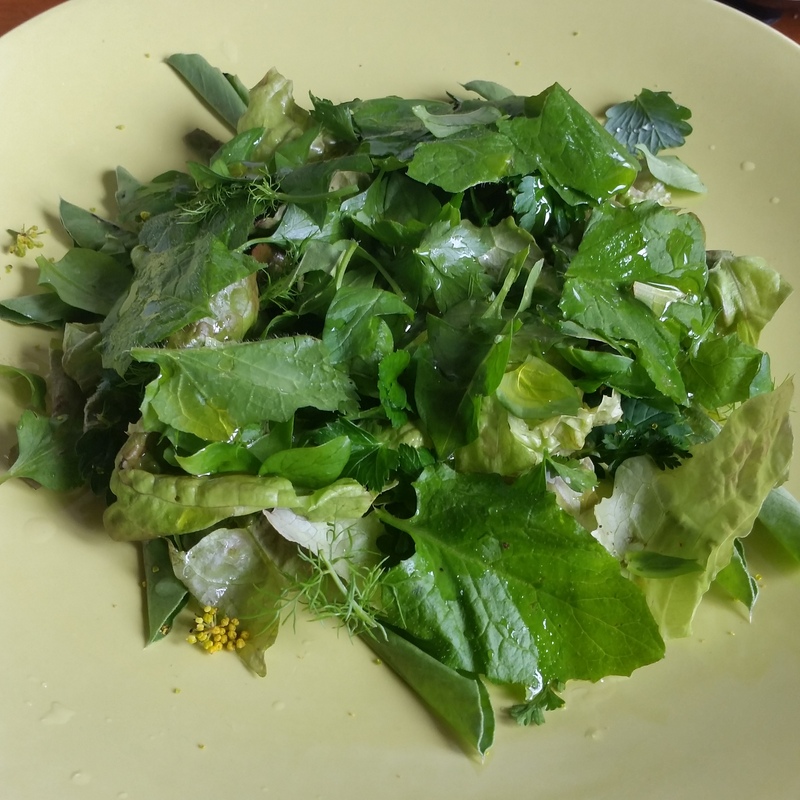 This salad was made with a base of leftover couscous and weeds included in the green salad are chickweed, red dead nettle, and scrambling speedwell. Each layer of the salad has squeezed lemon juice and some avocado oil. The avocado and the onion weed I mixed together in a separate bowl before adding to the green layer. Next the segmented mandarin and walnuts are added with a final dressing of avocado oil. The finishing touch are the flowers, violets and onion weed blossoms. In the past, before lettuce was developed, chickweed was used in the same way as lettuce is today. The soft green leaves are fairly bland and are a soft texture that is easy to chew. 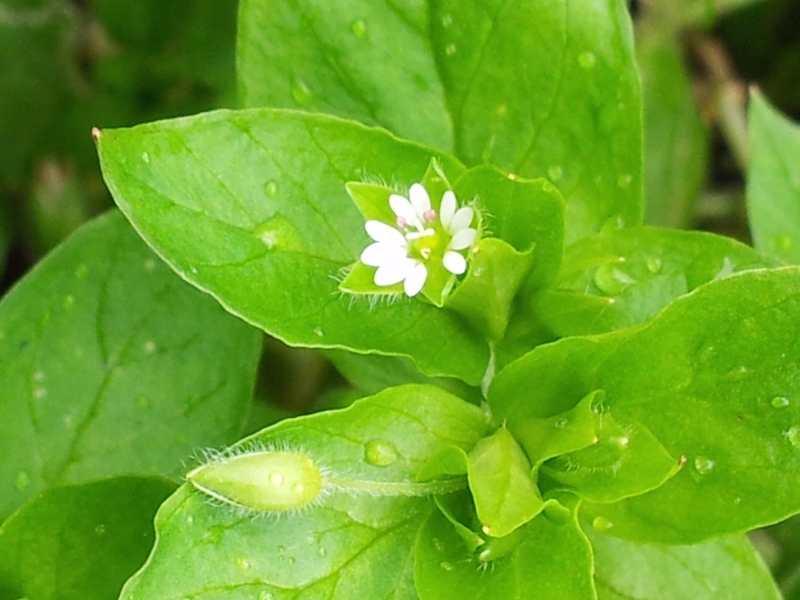 Chickweed contains mucilage and saponins which assist in the absorption of nutrients, especially minerals, and is a rich source of vitamin C.
Stellaria means “little star” and reflects the white, five, deeply divided, petalled flowers that grow on thin stalks in clusters around the stems of the upper leaves. The flowers are quickly followed by tiny egg-shaped seed capsules. It’s nutritional values make Chickweed sought out by those with hens or caged birds and indicates a high nitrogen level in the soil. It prefers cool, rich and moist conditions. It’s a temporary weed as It won’t live through summer. Media means “in the midst of” and aptly refers to the way chickweed grows in and around and over other plants. The tender, small, oval leaves with pointed tips are pale green in opposite pairs, on round, thin, sprawling stems. 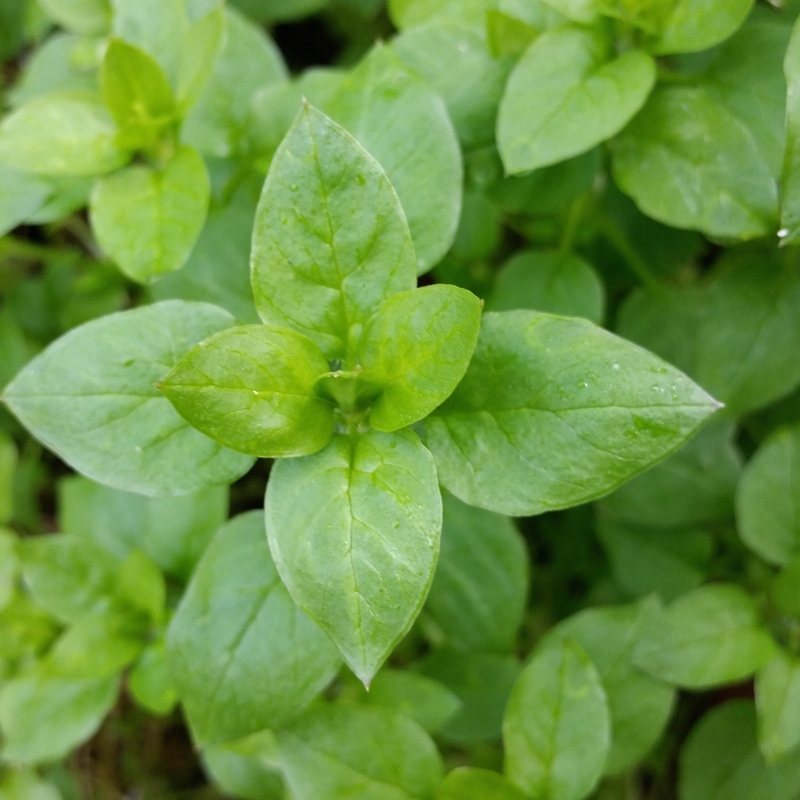 Consider chickweed as an easily obtained, nourishing and strengthening food. You can just grab a handful to add to a green smoothie, but for salads I tend to use just pieces of the thin stems where there are a cluster of leaves or pick off the leaves from the stem. It takes a little more time but avoids your salad being too stringy. Best practice is to collect and eat the plants soon after, but I’ve found that I often don’t have time to go foraging in the garden just before dinner and at this time of the year the weather can be most off putting. Once or twice a week I go to our organic community garden and do a harvest of weeds. I wash them, give them a spin in the salad spinner, and then sort into bags and store in the vegetable drawer of the refrigerator. This harvesting and sorting allows me to access prepared weeds as quickly as opening a bag of supermarket salad greens through the week. Always harvest where you know the ground hasn’t been sprayed with herbicides and avoid collecting near roadsides. 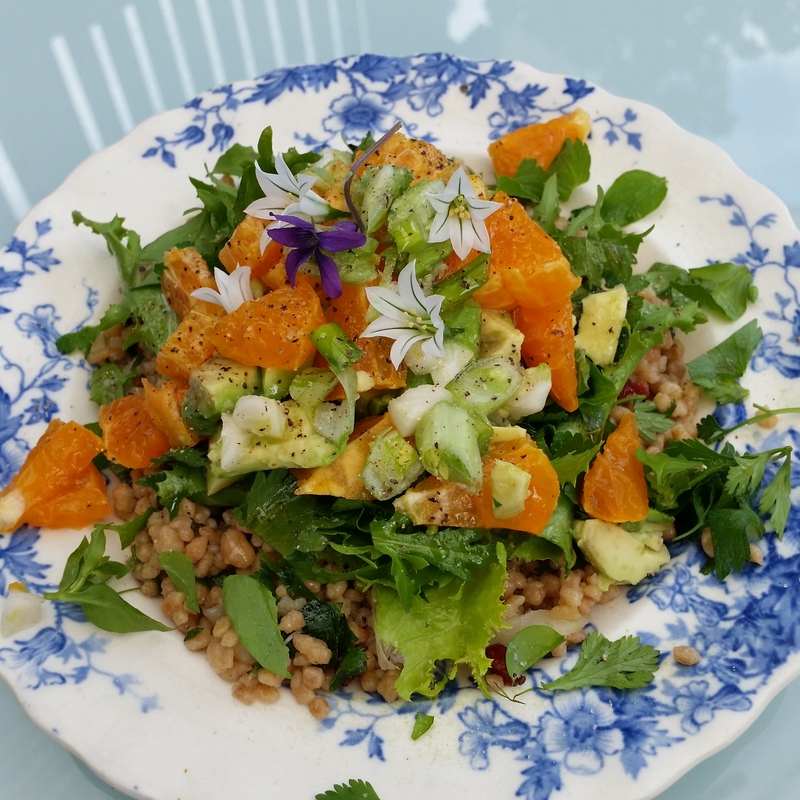 Green lentils with preserved lemon and garlic, grated carrot, orange, endive, parsley, chickweed, scrambling speedwell, plantain, Italian rocket, red dead nettle, feta, calendula and heartsease violas. The base of this lunchtime salad is warmed green lentils with added preserved lemon, crushed garlic and olive oil. On top of this is some leftover grated carrot, a little orange, endive and parsley (from the taco meal the previous night). 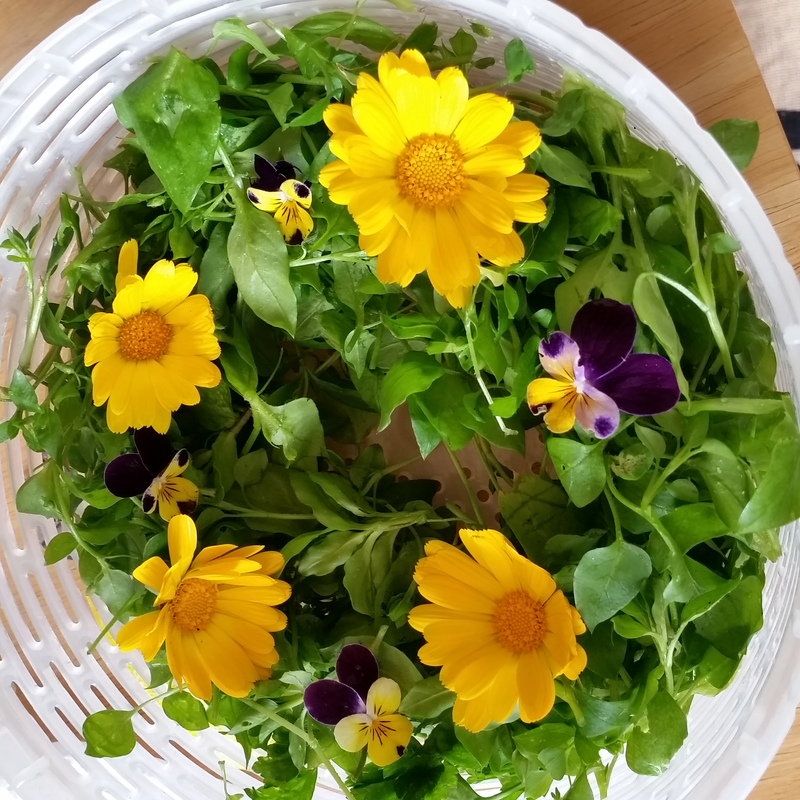 Now I add a good handful of harvested weeds, followed by slices of feta cheese and finished off with a scattering of calendula petals and heartsease violas. This salad took only a couple of minutes to prepare. 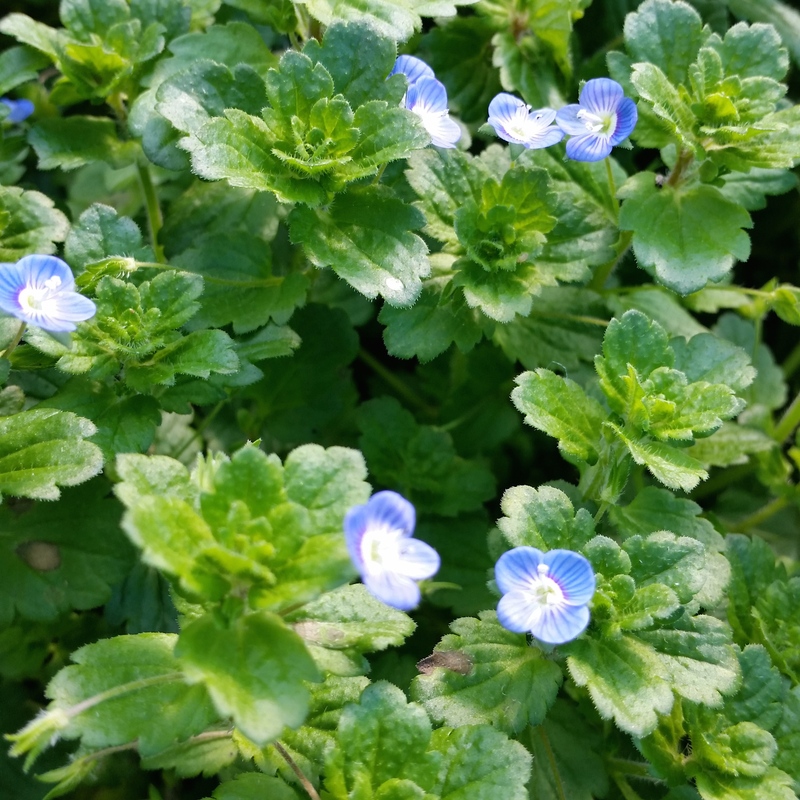 Speedwell is easily identified by its pretty blue flower. You can see why it’s also known as birds-eye speedwell with it’s distinctive white centre. It can be found scrambling around most gardens over winter and spring. The small blue flowers are 1 cm wide and appear as solitary flowers. They open on sunny days on thin stalks.The pale to medium green leaves grow in opposite pairs, are oval, short stalked, coarsely toothed and hairy.The stems are round and flexible growing up to 70cm long and easily root at the nodes. As it has soft hairy leaves it can be included in a salad with other greens but is best used added to a smoothie. If including in a salad I run my hand down the rough stem and the leaves easily peel off. It has an astringent quality to it and in the past was used as an black tea substitute in France (called Europa tea) because of that astringency , plus it’s smell is reminiscent of tea. It’s used as a medicinal tea to clear excess mucous, calm sore throats and eyes and assist with bad skin. Who would have thought that this small and abundant weed could do all that. A salad is greatly improved if dressed by the addition of oil, vinegar or lemon juice. Save your best oils for your salads. I usually make the dressing in the salad bowl by simply squeezing lemon juice over the salad, season it and then drizzle over a good oil. If there is a delay between making and eating then you should prepare a dressing separately and toss in just before serving. Sometimes too a salad might need a little sweetness with the addition of honey, a little more spice with mustard or a creaminess and in those cases I make up the dressing separately. This salad has a base of torn lettuce leaves and weeds. 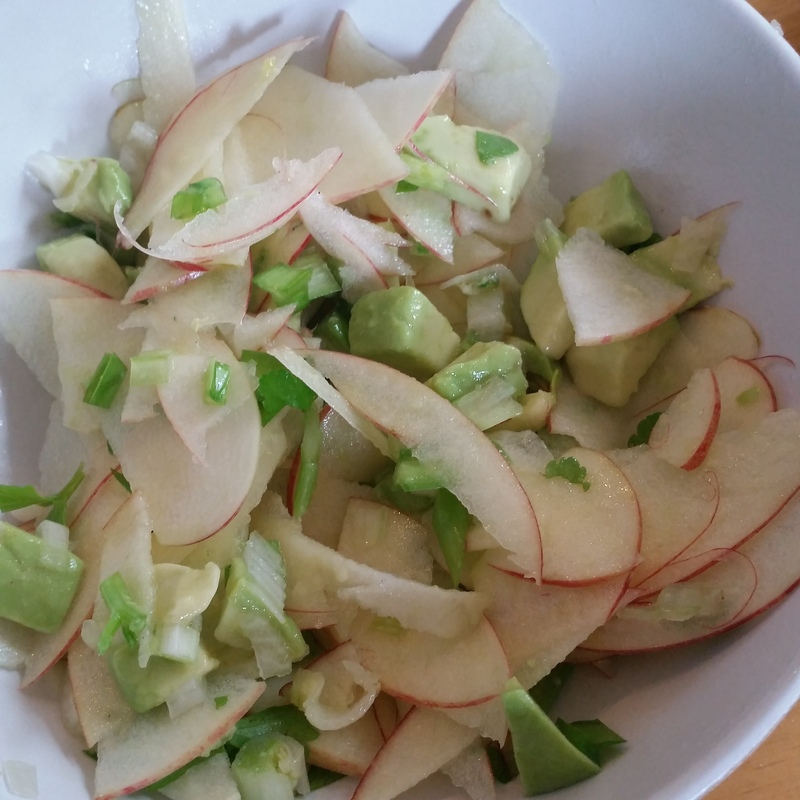 The apple, avocado and onion weed salad is mixed with kefir cream and topped with walnut pieces. Final touch is placing red coral mizuna around the edge of the green salad and adding the onion weed flowers, a sprig of salad burnet and a baby dandelion leaf. The green leaf base is constructed first and a squeeze of lemon juice and a drizzle of oil ensures the greens are easily digested and flavourful. I use a mandolin to finely slice the apple and squeeze lemon juice over the apple and avocado to prevent from browning. The creamy dressing doesn’t have to be kefir based, it can also be made from yoghurt or use your favourite mayonnaise. I counted 13 plants and flowers in this salad before adding the fruit and nuts: lettuce leaves, red coral mizuna, salad burnet, onion weed and flowers, dandelion leaves, nipplewort, chickweed leaves, chervil, parsley, fennel flowers and leaf, baby celery stalk and leaves, baby broadleaf plantain, and broad bean leaves. All these plants have different nutritional benefits. Red Dead Nettle’s leaves have soft hairs unlike real nettles. It’s usually plentiful in loose soils in the garden. For me, it’s often an unwelcome early guest in a newly planted seedbed so it’s some comfort that I can eat it. It’s adaptable and can grow almost anywhere. In lush garden conditions it will grow up to 50cm tall or quite low and spreading where it’s dry, e.g. in a drive way. It’s most commonly found during the cooler months. Red Dead Nettle Lamium purpureum has toothed heart shaped leaves in opposite pairs with long leaf stalks. The stems are square and hollow similar to other members of its family, mint and lemon balm. It’s a highly nutritious plant full of fibre, chlorophyll, vitamins, iron and other minerals. The oil from the seeds is high in antioxidants. 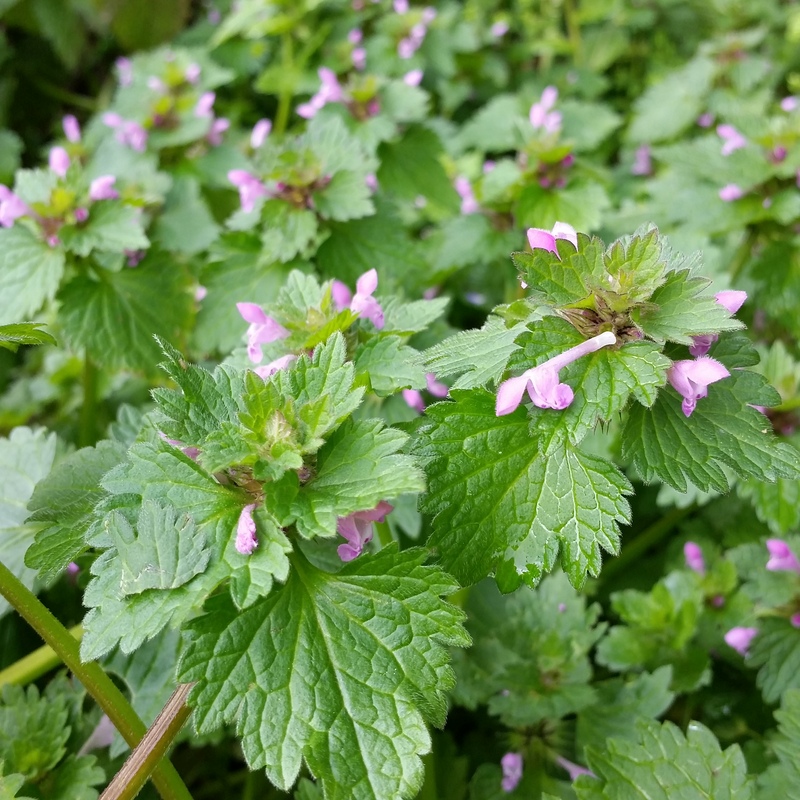 Red dead nettle is mild tasting so is a great plant to include in your salads or smoothies…but those hairs need dressing. It’s important to correctly identify your weeds. Never add anything to a salad that you are unsure of. As a part of my organic horticulture course I completed a plant identification project with over twenty plants that could be found growing wild in a New Zealand garden. If you are interested in identifying more edible weeds in your garden, as well as see their medicinal values, you are welcome to visit my organic growing blog Soil beneath my fingers. Nipplewort Lapsana communis L. The juvenile form produces”spoon-shaped” leaves that later become more pointed. This is the best stage to harvest if you want to avoid the bitterness of older plants. Plants tend to grow in semi-shade areas and in summer shoot up to over a metre tall with dandelion type blooms. The shape of the flowerbuds gave this plant it’s common name nipplewort. When our children were little Peter would tell them to eat up their vegetables or salad because the strong silver backed gorillas ate a lot of plants. It’s true silver backed gorillas will eat various parts of over 200 different plant species. We would be hard pressed to achieve that level of diversity in our diet. This spring take another look at the weeds in your backyard, think about adding them to your salad greens to add diversity and nutrition to your salads. You’ll never be accused of a boring salad if you do. Would like to see your comments or share some of your favourite recipes. ARTEMIS Therapeutic Natural Remedies :: Traditional Remedies That Work! :.